By Audrey Golden. Oct 13, 2015. 9:00 AM. If you’re interested in traveling to Chile and visiting the homes of the Nobel Prize-winning poet Pablo Neruda, you’ll need to plan to make your way to three different properties in three different cities. Indeed, Neruda had a home in Santiago, the capital of Chile, as well as two other properties in Valparaiso and Isla Negra. Each is now maintained by the Fundación Pablo Neruda. If you decide to make the treks, we promise it’s worth it. The first stop on your trip should be to La Chascona, Neruda’s house in Santiago, Chile. The property is located in Barrio Bellavista, and it sits in a quiet part of the neighborhood at the bottom of San Cristobal hill. Construction on the house began in 1953 at a time when Neruda was involved in a secret affair with Matilde Urrutia, the woman who later became his wife. Neruda named the house “La Chascona” for Matilde, who had a mane of flowing red hair. Neruda would later write a poem, “La Chascona,” which appeared in La Barcarola. The house is actually made up of several different structures, designed by the Catalan architect Germán Rodríguez Arias, with whom Neruda had worked years earlier on his home at Isla Negra (don’t worry — we’ll get to that house soon!). In addition to the varying living spaces on the property, La Chascona also was designed to have a small waterway flowing through it. While Matilde lived alone in the house during the years following its construction, the Mexican artist Diego Rivera — a great friend of Neruda — painted her portrait. Both the finished version of the painting, as well as a study for the portrait, currently hang in the museum for visitors to see. Other objects at La Chascona include matryoshka dolls, a giant shoe from a store in Neruda’s home town, and colored goblets on the dining room table. The house is now a museum that welcomes visitors, but it was the sight of much destruction during the military coup in 1973. Supporters of Pincochet’s regime ransacked the house, destroying much of its contents. Indeed, Neruda’s library was thrown into the flowing waters that ran through the property, and the house itself was flooded. Fortunately, many of the poet’s belongings were saved, and visitors can view the house much as it looked when Neruda was alive. In the late 1950s, Neruda sought out another home in which to find solitude. He thought of Valparaiso, a truly unique city set into the steep hills of coastal Chile. A friend of Neruda’s located the property for him in the late 1950s, and after several years of reconstruction, the poet moved into the house. Inside the home, Neruda hung a portrait of Walt Whitman, as well as kept numerous other belongings, including a collection of maps, a merry-go-round horse, and Argentinian gaucho spurs. He also installed porthole windows to look out onto the sea. Like La Chascona, La Sebastiana was looted during the coup. However, it was restored in the early 1990s and opened for visitors in 1997. Neruda commemorated his purchase of the house in a poem entitled “La Sebastiana,” which appeared in the collection Plenos Poderes [Fully Empowered] (1962). Getting up to the property is a feat in and of itself. Visitors can ride many of the small funiculars that go up into the hills, or Neruda enthusiasts can walk up the very steep streets to the mansion. 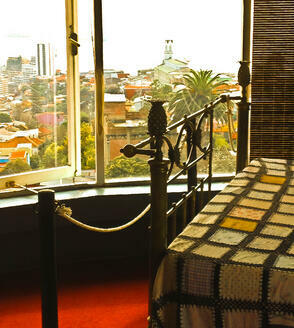 Regardless of how you make it up to La Sebastiana, you’ll find yourself on a balcony with stunning views of the city, surrounded by some fascinating items in Neruda’s collection. We’ve saved the best for last. 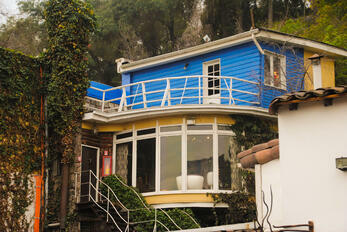 In 1938, Neruda bought this property, which stands on the very edge of the coast in a small town in Chile. As we mentioned, Neruda hired the architect Germán Rodríguez Arias to design additions for the home. Neruda kept the most significant items in his collection — which was vast, and comprised of many, many different objects — at Isla Negra. Most notably, Neruda collected wooden figureheads from ships, and they now grace one of the living areas in the house. He also had magnificent collections of seashells (which have been painstakingly cataloged), masks, bottles, and intricately embroidered tapestries. Isla Negra is the spot where Neruda spent his final days, in a bedroom with large windows that looked out onto the raging sea. The poet was buried at Isla Negra in 1992, where his remains lay beside those of his wife, Matilde Urrutia. It’s not easy to reach Isla Negra — you’ll need to take a bus, and you’ll need to speak a little bit of Spanish and have a good idea of where you’re going. 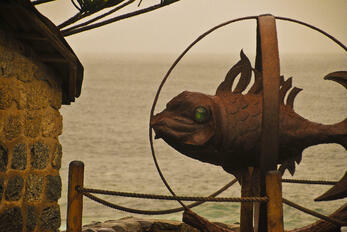 But of all the homes in which Neruda lived, we can’t recommend a visit to Isla Negra enough. It’s the only museum property that requires visitors to buy tickets in advance, so be sure to plan ahead. And whether you visit just one or all three of Pablo Neruda's homes, enjoy your trip to Chile!